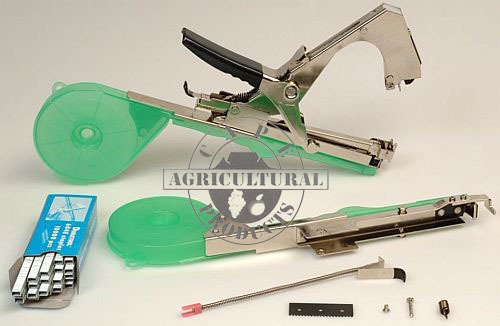 The Duratool tapetool machine is used for attaching and binding various types of plants to stakes and trellising wires. Crops that can be trellised include grape vines, berries, tomatoes, peppers, cucumbers and others. In the nursery the tool can be used for attaching plants and young trees to stakes for training. The Duratool tapetool increases your efficiency and is much faster than using twisties or loose pieces of tape. Looks better on the plant. 3. 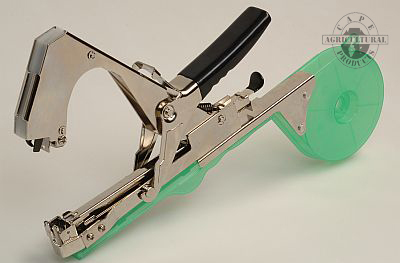 The handle is then depressed to engage the staple and cut the tape in 1 action, leaving a secure loop. The duratool tapetool is now ready for the next tying action, it couldn't be simpler ! 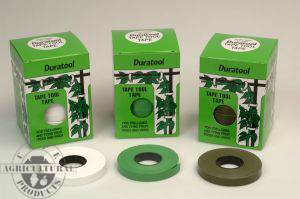 Duratape is supplied in different thicknesses [see charts below] and there are 10 rolls of tape per box. * Note : The length of binding, and quantity of bindings per roll, are only approximate quantities for guideline purposes. The exact numbers are dependent on the user. 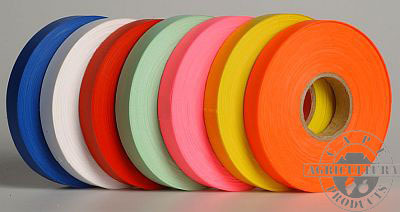 If the 250micron tape is used for tying vines, or smaller plants, then more bindings per roll will be achieved. The 250micron tape is recommended for more mature plants, or plants requiring more support. We are also able to supply tape in other colours if required for special marking purposes such as marking different cultivars in the nursery environment. These colours include : Neon pink, Neon Yellow, Lime Green, Neon Orange, Blue and Bright Red, as seen here. To complete the loop staples are required and these are available in the standard boxes of 4800 staples, or in bulk boxes of 10 000 staples. In order for the Duratool machine to work effectively and efficiently it is critical that the user monitors the condition of the cutting blade. 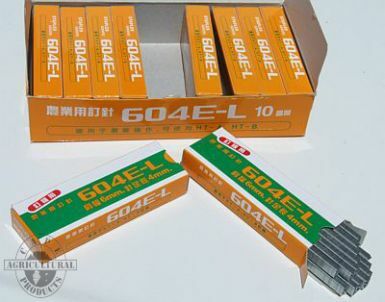 If the blade begins to get blunt the user will struggle to cut the tape cleanly resulting in wasted time as well as tape. 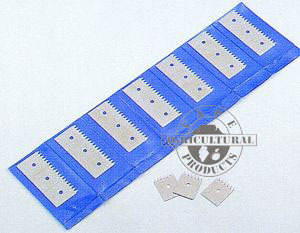 Cape Agricultural Products is able to supply you with replacement blades that are supplied in packs of 3. A range of the most common spares required is also available to keep the Duratool in good working order. Go to our Contact us Page to see our other contact details.